Second, I found Michael Miller's Bad Cats print (in one booth...) Once I got home, I added that and the indigo that my husband washed for me to the cat chrm quilt - & I started to sew the blocks together :o) Now to cut the setting triangles. Also only in 1 booth, I found some Joel Dewberry prints. the prints I found go with those on the top row. Susan came to my rescue (At her shop they are cutting charms)! & then they sat next to another "mod" collection of charms (Summer in the city). I now will be turning them into circles and applying them to a chocolate background - with the circles lined up nice & touching. :o) (I might mix in some other fabrics - for a nice 10 x 10 layout of the circles - I have about 75 now...) Maybe some of that Joel Dewberry stuff? The fabrics I was telling you about from Sunday... I hope to find more of these on Sunday in Hershey. They are divided by "line" the bottom being Aviary. Once upon a time ago, when we first purchased our Condo, we replaced most of the appliances. The laundry unit stacks in the kitchen in our unit. The old one started to go bad about a month or so ago, my husband figured out how to make it work using the delicate cycle & spinning it twice... So we went shopping for a washer/dryer. To begin we did not want the apartment sized model that we had - laundry was going all the time with just two people. Second, we only have 26.5 inches in which to place a new washer dryer unit. Most of them are 27 inches... So we found one at Sears & the sales lady looking at the brochure assured us that it would fit, so we ordered it. When it came in, it did not fit - luckily we figured that out before they took it off the truck. So what to do... In the mean time, the dryer quit getting hot, so we have been doing weekely jaunts to the laundromat - FUN, NOT! Third "issue" the old unit used gas for the dryer and 110 volts for the electric. Gas is only available with the apartment sized unit in our size range, so we had to hire an electrician to give us two 220 electrical boxes, one for the washer & one for the dryer. Yesterday, our new washer/dryer was installed. We got it in stainless to match the other appliances. Something quilty on a quilt blog... One of my current WIPs. Hop Skip and a Jump pattern by Denyse Schmidt. 4 of 12 blocks, Kona Snow with an assortment of dark blues, including a selection of my Judaica Prints. Since the second anniversary gift is traditionally cotton, this is potentially a gift for my husband. Rhapsody's response to the squirrel. The infamouse (typo - but the sentiment fits, so it is staying) cat vs. squirrel part 2 photo. Have you been to GoneAussieQuilting ? Did you see what She just got? Joel Dewberry fabric... I just got some too & I got some of the Aviary collection too. (My LQS got an "intersting" assortment to say the least...) I hope to get some more in Hershey. & I did a bit of hand quilting on my Freshcut Courthouse steps quilt. For Laurie Ann at Quilting Rush I am sure that this will work with Zucchini too. You may not even have to puree the squash, just "steam" and slice/layer. Preheat oven to 400°. Brush an 8-inch square baking dish with oil; set aside. In a medium bowl, mix squash purée with sage, 1 ½ teaspoons salt, and ¼ teaspoon pepper. In another bowl, mix ricotta with ½ cup Parmesan, 1 teaspoon salt, and ¼ teaspoon pepper. Set aside. Lay 2 lasagna noodles in the bottom of prepared dish; spread with half the squash mixture. Layer with 2 more noodles, and spread with half the ricotta mixture. Repeat layering with remaining noodles and mixtures. Sprinkle top (ricotta mixture) with remaining ½ cup Parmesan. Prepare Basic Acorn Squash. When cool enough to handle, halve each squash lengthwise. Scoop out and discard seeds; scrape out flesh from squash halves, and transfer to a food processor (discard skin). Process until smooth. You can also season it and serve it as a side dish. In a medium saucepan, combine squash purée with 2 tablespoons butter and 1 teaspoon coarse salt. Cook over medium heat until hot, 3 to 4 minutes. Transfer to a serving dish, and sprinkle lightly with ground nutmeg. Preheat oven to 400°. Place 2 whole acorn squash (about 2 pounds each) on a rimmed baking sheet; bake, turning occasionally, until very tender when pierced with the tip of a paring knife, about 1 hour. O.k. So I stole the photo from Susan (She sent me the quilt, I guess I can have the picture too.) go ahead & pooh-pooh me. I am a bit of an enabler... So when she said that she thought about joining, but was worried about thetimeline & such - I suggested that we do a 1 for 1 swap. We did decide to finish them by the end of july, so Iam not late - yet. But it has been waiting patiently for the binding for a while... I even hand quilted the little bugger. Hopefully I can bind it tonight before my husband gets home to remind me about my homework & housework. So i was finally able to try Libby's Tomato Pie - AWESOME! Only I decided to buy a frozen pie crust... I had to buy two crusts & they are not packaged in a manner conducive to refreezing - if that is even safe to begin with... So what to so with the other crust? Make an apple pie... Not as good as Libby's Tomato Pie, but it used the other pie shell, & it was rather soothing to peel, core & slice all of those apples. No, I am not making this quilt... (Nor am I going to try to do the one that had the star points made out of quarter square triangles.) 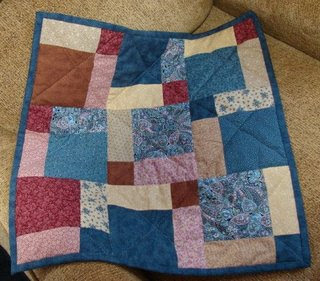 I can & do like several quilts without the desire/need to make them. My Doll Quilt Swap II came from Becky at Quilts and Such. As I mentioned before, I used to collect these Oriental prints & I still have a few UFO's to complete & A stash big enough to make several other things - like I thought I would make a jacket - so I have some BIG pieces... (Not something I can say for the most part... I like variety, so I buy lots of small pieces, not a few big pieces.) Now I kind of want ot work on this stuff again - egads - it is a wonder that I finish anything! I am such a dandylion! My Quilt went to Erin at Art Momma. Once Upon a Time, pattern by Ringle & Kerr in their book Modern Quilt Workshop. (Totally inspirational - 1 book that I would recommend.) & when I was working on Plain Spoken, I e-mailed a question & got an answer... YAY! Would you like to visit the Lady's blog: Go here: Ruth's Place. The is the quilt that I got from South Dakota. I'll write more next late, including the makers name & a hyperlink. I love it, I used to collect these Oriental prints & I still have a few UFO's to do using them - seeing thise little gem, I am (almost) spurned on to work on them... :o) I'll post what I have been working on and the "next in que" projects later in the week. I am so glad that everything worked out in the end - I guess postal wise, I really did sweat the small stuff. This is the baby quilt that I sent to South Africa. (One that I worried about with the postal issues...) I'll write more next week. including close ups. i got a lot of great advice on the small stuff, thanks. I suppose everyone has heard the expression, "Don't sweat the small stuff." right? My MIL says "That's chicken sh!t" which is the same thing with a more colorful New York accent/dialect/translation. If I mail something first class to another state in the East & it takes far longer than it should, & I worry over it, like a soft boild egg - am I sweating the small stuff? * Is this o.k.? When has it gone too far? The one thing that resonnated from my college experience is my standing in line at the bookstore and overhearing a girl telling her friend that the soda & candy had to be on a separare tab becasue her dad would only pay for her books. Meanwhile no one even bought me a pencil. Yes, I am still working on those feelings... It is a long process, & with my dad bringing up my (he fails to include my sister or 2 step-brothers in the equation) sneaking the food listed above... An afternoon snack for a tween/teen was not part of his purchasing matrix. I have a GF who when she moved out of mom & dads house had all of her furniture purchased for her, condo painted, carpet replaced, bathroom decorated - no make do for her, when she had an "oops" with her budget, her dad paid the bill, her dad still covers her auto insurance/cell phone, because it is not a hardship on him & because it is easier all around to stick with the status quo... So she has a completely different level of viewing "chicken sh!t/small stuff." As in I have never seen her worry about ANYTHING. *Once again, I am also putting my (thoughts/feelings/actions/reactions) onto someone else... because yes, I am wondering if the receiver has it, but has been too busy to mention it. I know life gets in the way, thigs get set aside, etc. So yesterday was the 4th of July - Happy belated Independence Day to those of you who celebrate it (Happy belated Canada Day while I am at it...) It sure felt like Saturday which made coming into the office especially hard this morning. So my husband & I went out for brunch at IHOP - I love that they give you a couple of pancakes on the side :o) Next to my IHOP is Hancock's the chain fabric store. Since we had a wait, I perused... I found 7 new to me cat prints MEOW! (The quality is o.k., not the best, but not the worst either, I buy what I like, where I like.) On the way home, we stopped into the Joann's as well where I found several (20-ish) new to me cat prints as well. >^..^< I had not shopped in either store in a while. We had pretty bad storms, but I was in studying, watching a movie - related to my class, and cutting some new cat fabrics for my cat charm quilt. All of this make Amy a happy gal. I only "need" 27 more cat charms :o) for my charm quilt. Plan B has 36-patches on point with the 9-patches - 36 (with 6 on a side) is double the 9 (with 3 on a side) so it works out much better. So last night I sewed charms into pairs getting them ready to attach to my "25-patch blocks." Oh postal delivery system, why do you vex me so? Last week on like Monday I sent a package via first class mail that should have arrived on Thursday or Friday... Did it? Apparently not. I also sent a package to a foreign land complete with tracking (not that I remembered to keep the receipt - the mail is supposed to work, I should not have to track it, ahem.) and it should arrive today or tomorrow. Hopefully one of my packages will arrive to its destination soon. I start yet another class tonight - this one is sure to kill me based on the reading list alone... 5 weeks - 2 days per week, 4 text books and excerpts/articles numbering the multiple 100's of pages... AYE! AYE! AYE! Happy quilting and exercizing - I'll keep the bah humbug on studying to myself.